If you need an antidote for Downton Abbey withdrawal, and who among us does not, try Amazon's new Julian Fellowes Presents Doctor Thorne. This three-part British series, based on the Anthony Trollope novel, drops Friday on the streaming service, with a satisfying sweep of Victorian elegance and cliffhanger romance. Yes, and series was indeed adapted by Julian Fellowes, who wrote Downton. 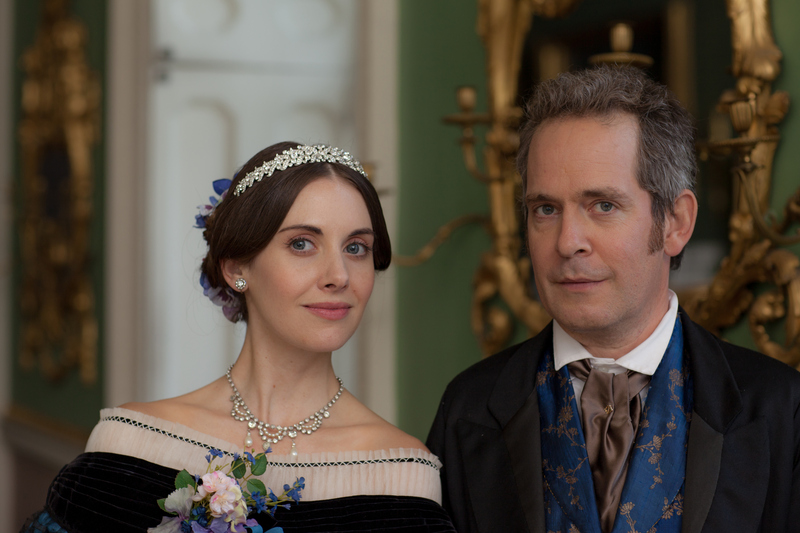 Set in the 1850s, Doctor Thorne largely revolves around Mary Thorne (Stefanie Martini) (photo above....all photos from Weinstein Company/Amazon Studios), a lovely young woman of about 20 who was raised by her uncle, Dr. Thorne (Tom Hollander). While she has no personal riches, she spent much of her formative years at the estate of the Gresham family, which did. The Greshams are run by the domineering and rather unpleasant Lady Arabella (Rebecca Front), who somehow has raised a kind and considerate son, Frank (Harry Richardson) (also in photo above). Doctor Thorne opens with a series of polite, rather formal social interactions much in the style of Jane Austen. From these it is clear that Mary and Frank are in love, though Mary fears his social rank would render her unworthy as a wife. Frank's family feels the same way, it turns out, because they have a secret. They're broke. 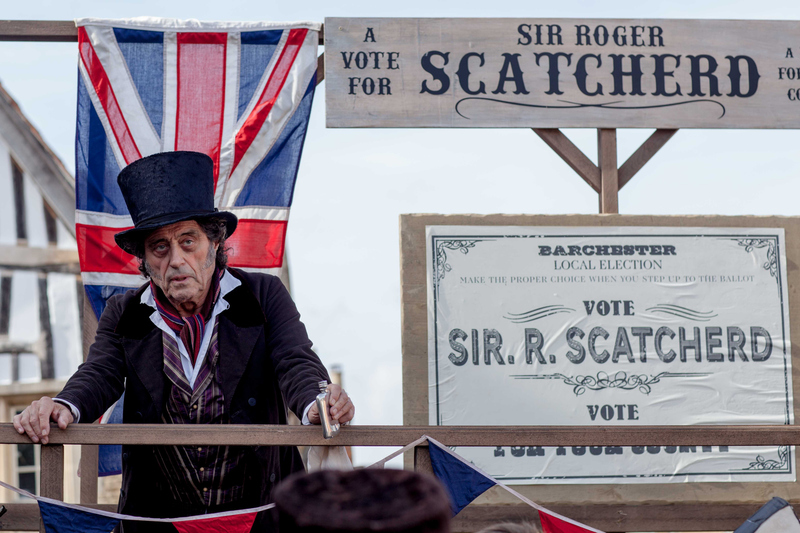 Years of gambling and reckless spending have forced them to mortgage 90% of their holdings to Sir Roger Scatcherd (Ian McShane) (above). The only way they can buy them back is for Frank or a daughter to marry money, big money. Specifically, they'd like Frank to make a play for Miss Dunstable (Allison Brie), a rich American who playfully collects marriage proposals from Brits who want her cash. Frank actually gets along quite well with Miss Dunstable, having told her up front that he's in love with Mary. This appeals to the side of Miss Dunstable that would like to believe in romantic love, not a fiduciary union. Meanwhile, the course of events makes the Scatcherd debt increasingly urgent for the Greshams. It also finally makes Mary aware of a secret about her parentage that we viewers knew from the start. All these secrets tumble together with some very bad behavior and some rather noble behavior to rearrange the social, financial and romantic playing fields. In large measure because it's only three episodes long, Doctor Thorne has neither the sweep nor the soap of Downton Abbey. That's not a mark against it, just a gentle warning to fans who might be tempted to compare any British period drama to Downton. 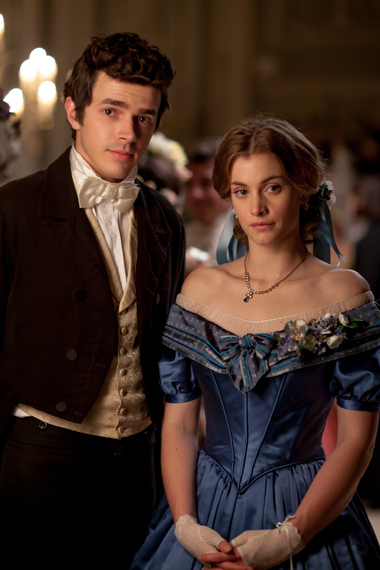 Doctor Thorne is striking on its own, with lovely visuals and beautiful costumes. Its cast is large enough that a few players inevitably feel two-dimensional, though Fellowes gives solid nuance to most of those about whom we care most -- including Miss Dunstable and Dr. Thorne, seen above. From its early breezy and wry Austenesque air, Doctor Thorne turns somewhat darker through the middle passages. As in many stylized period dramas, we viewers know what we'd like to happen, and then must wait and see if there's any way it can. You won't be sorry this doctor is in the house.